In a large mixing bowl, combine all of the listed meatball ingredients, except for the coconut oil which is reserved for browning the meatballs. With clean hands, mix everything together until it forms a lovely uniform texture. Portion the meat mixture into 12-14 balls. Roll them between your hands to form nice uniform balls. Set aside. Add the coconut oil to a dutch oven over medium-high heat. Add your meatballs in a single layer to the pan and brown them evenly on each side. This will take several minutes. If you don't have a dutch oven that will accommodate that many meatballs at once in a single layer, simply fry them in batches. Once all of the meatballs are cooked, remove them from the pan and set them aside on a clean plate. 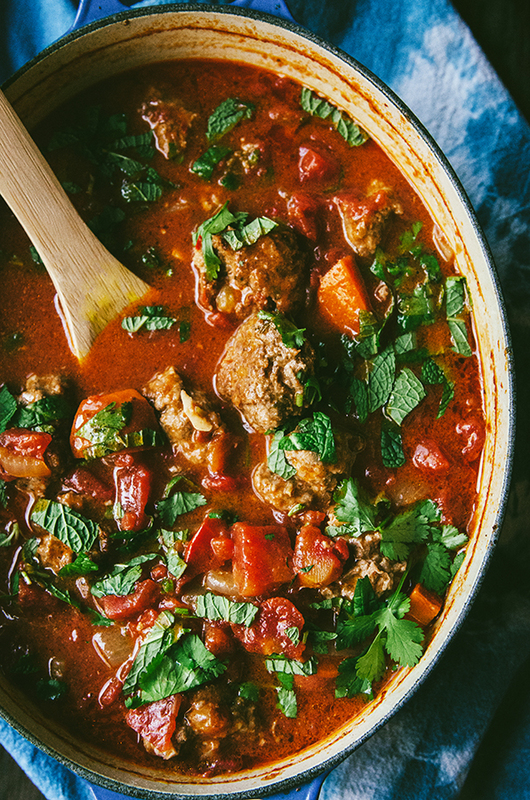 Start building the sauce in the same dutch oven that you just fried the meatballs in. Add the onion and garlic to the pot and allow them to cook down and begin to sweat in the meatball juices. Once they are soft, add in the sweet potatoes and stir. Allow them to cook together for a few minutes. Add in the tomatoes, spices, harissa, bone broth and coconut milk. Stir together until the sauce looks even and the coconut milk is evenly distributed throughout. Add the meatballs back into the sauce. Allow the sauce to come to a simmer over medium heat. Once it's simmering, add the lid to the dutch oven and put the pot into the oven. Bake for 30 minutes. Remove the dutch oven from the oven and remove the lid. The meatballs should be completely cooked through and the sweet potatoes will be fall apart tender. Serve and garnish with a bit of fresh mint or cilantro! Enjoy!